Hello lovely readers! 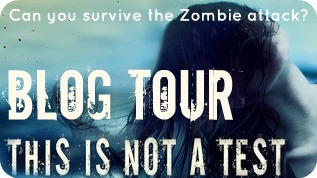 Welcome to the blog tour's stop at Maji Bookshelf for This Is Not A Test by Courtney Summers. A survival novel about a bunch of teens during a zombie apocolypse. Read below to check out my interview with Courtney Summers herself and find out what her plans are for the next book! and let me tell you, I am already excited for it! Also, come back tomorrow to find out what I thought about This is Not a test! Courtney Summers was born in Bellesvile, Ontario, Canada in 1986 and currently resides in a small town not far from there. When she was 14, she dropped out of high school so she could pursue her education. Now she writes gritty young adult novels. Courtney Summers can't wait for the zombie apocalypse. Also she is the author of Cracked up to Be, Some Girls Are, Fall For Anything and the newest novel This Is Not a Test, four edgy young adult novels published by St. Martin's Press. 1.Why did you pick zombies as the creatures that have basically ended the world in This Is Not A Test? Becoming a zombie or losing those you love to zombies or having the people you love become zombies is so terrifying! Zombies really force you to think about what makes us human and what we're living for and I really wanted to explore that in a novel, so that's essentially why I chose them. The zombies in This is Not a Test determine how the characters view the world, each other, themselves, their past, present and future. If it had been any other creature, it wouldn't have been the same book. Also: I love zombies. I'm a bit obsessed with them! 2. If only one character lived in the end of the book, who would it have been? why? I enjoyed writing it as much as my other books. It was intimidating stepping into a new genre but there was a lot that was familiar and comfortable about it too--I'm used to writing about teens pushed to their limits and This is Not a Test was no exception. 4. The ending of This is Not a Test left me wanting more! Are you thinking of writing a sequel or moving on to another project? I have no immediate plans to write a sequel to This is Not a Test but that doesn't mean I'll never write about zombies again. For now, I'm working on a new book, my fifth book. 5. What are your plans for your next book? paranormal, contemporary, or another genre all together? My next book is called All the Rage and it is zombieless. It's about a girl who, after blackmailing a rich classmate, wakes up on a road with no memory of the night before. It's a bit of a mystery, a kind of psychological thriller. It's due out from St.Martin's sometime in 2013. Thanks for having me on your blog, Juhina! Thank you Courtney for this lovely interview!! Doesn't that make you guys wanna pick up this book right now?! I really enjoyed this book. It was really refreshing for a zombie novel. Don't get me wrong, I'm a zombie addict. But throwing a contemporary feel into the mix was such a good idea! This is not a test attacks the story from a different angle. We still have zombies, or mutated walking dead caused-by-a-virus things. In this variation the "zombies" can run, an important note for a zombie novel. A good majority of the book is spent in a single location. It isn't until the end of the story the plot line focuses on the outside world. In fact, the zombies aren't the main focus of this novel whatsoever. They exist. They are the cause for the purpose of the book. They are the driving force that causes this group of characters to come together. But they are not the primary focus. This Is Not A Test focuses on two different events; how a group of people act and react together in a survival situation, and what if one of the people doesn't want to survive? This is a very different and interesting approach for this kind of book.